Behold! A list of my August favorites. 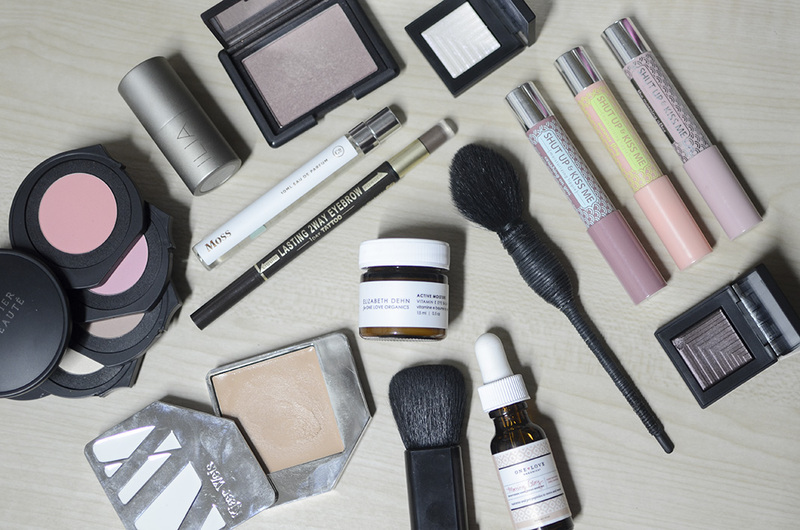 Frankly, it has been a great month for beauty discoveries, aka consumerism. But yanno, at least I liked what I bought! Kjaer Weis Cream Foundation (in all its grotty glory). The thing with this foundation is that you must like constantly wiping your cosmetics compacts. I love this foundation. I can’t stop reaching for it, and it inspires in me a thirst to try new bases, even with the knowledge that I’m probably going to like this one more than whatever new thing I’m compelled to try. I wear the shade Just Sheer and I wrote a review here. Ilia Beauty Multi-Stick in All of Me. I haven’t written a post about this, but there’s nothing really new to say about this. I do like it on my cheeks and my lips, though. It’s a very easy color to wear in a pleasant-enough formula. NARS Dual Intensity Eyeshadows in Cassiopeia & Subra. Sometimes I balk at how expensive these eyeshadow singles are, but then I forget all about the price tag when I start using them. I truly love these eyeshadows and I almost don’t want to keep using them for the irrational fear of running out. See them in action here. NARS Powder Blush in Sin. An oldie but a goodie. This is just a perfect blush. It doesn’t look like much when swatched—actually, it looks kinda like a bad idea—but on the cheeks, it is stunning and dare I say it—perfect!. This is probably my most favorite brush that I own, and that’s saying a lot. It’s a beautiful, soft portable face brush that I can use for blush, contour, and all over the face. It’s brilliant. Le Métier de Beauté Kaleidoscope Cheek Kit in Cheeky Chic. Another blush rediscovery! This is technically four face products, but I primarily use the 3 upper tiers—the two blushes and “bronzer”. It is a beautiful all-in-one cheek wardrobe. I’ve reviewed it here. Another face brush favorite—the NARS Yachiyo Brush! This is a fan favorite, and I have to say that it lives up to the hype. This blends like nothing else. Happy Skin Shut Up & Kiss Me Moisturizing Lippies. Seriously, I need an intervention. I stopped by a Plains & Prints counter today to check out their newest shades and it took all of me to not give in to the two I was thinking of getting. These are amazing and extremely easy to use. One Love Organics Morning Glory Brightening Complexion Booster. My skin’s best friend as of late. I love how this feels on my face. Elizabeth Dehn for One Love Organics Vitamin E Eye Balm. This is heavy-duty stuff—my choice for under-eye hydration. My top fragrance favorite for August. And now, to check up on my progress with my August Beauty Goals. — Pay attention to ingredients. DO NOT BUY if it contains squalene, polyethylene or palm oil. I am dumb. All of the MAKE products I bought contains polyethylene. All of them. If you recall from my last goals post, I wanted to avoid polyethylene because it’s basically plastic. I only had exfoliating scrubs in mind (since that’s how I learned about polyethylene in the first place) and neglected to check my makeup, and when I did—it was there. DUN DUN DUN. I am super upset, but it’s no one’s fault but mine. 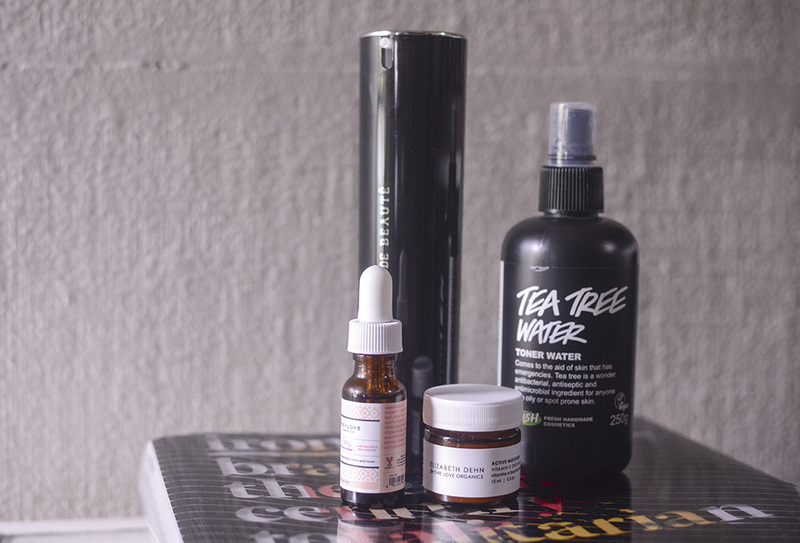 — Read more about ingredients and clean(er) beauty. Clearly this is a fail, but I’ve also been self-educating myself via the various resources online. Did you know that LUSH contains ingredients like sulfates and parabens? I didn’t, but now I do. I think this really boils down to a matter of preference re: cosmetic ingredients. I actually bought and received No More Dirty Looks by Siobhan O’Connor & Alexandra Spunt, so I’ll try to get more into this. — Make a shopping list for upcoming trip. Try to be thorough, ruthless (in editing), and stick to it. A success, in the sense that I’ve made a list. And remade it. And remade it. I want to see if I can limit myself to 10 makeup things purchased on this trip… A month and a half in the land of the free. HAHA. Let’s see. — Wear more colors. At least 5 times this month: Yes. — Clean brushes (make it a habit): Nopes. — Try to streamline skin care: Yes, ish. A short list for September, since I’ll be gone for most of it. — Stick to to-buy list, as much as possible. Set a personal budget. Quality over quantity. — Be diligent with skin care, even if you’re traveling! And that’s it! Feel free to share your beauty (or non-beauty) faves this month and if you have any “”beauty goals”” you want to work on, too! I should have specified! Squalene was derived from shark liver, but I think that’s generally not the case with non-Asian beauty brands. Unless it’s specifically stated as olive-derived (like Indie Lee products), I’d like to avoid it. I almost had my heart broken when I saw squalene in some charlotte tilbury products. Good thing I re-scanned the list and saw that it says olive squalene. Anyway, polyethylene may be safe for the face, but I think it can harm the ocean because they’re very tiny and can’t be filtered out. I can imagine them getting sucked in fishes nostrils or whatever. Yay! Haha Tom Ford uses squalene also, but I think for the most part, squalene in Western products are olive-derived. WHICH IS WHY I DON’T UNDERSTAND THE COMPANIES THAT STILL SOURCE FROM SHARK POACHERS. I think the beads are tiny, but I’m not sure how polyethylene is formulated in lip products or eyeshadows. My rule for now is to rule out scrubs with polyethylene as the exfoliators. I’ve stayed away from beady cleansers. If I remember right, those polyethylene beads are the ones specifically mentioned that can cause harm to fishies. Other polyethylene, I don’t know. For now I’ll do whatever you do, haha! Haha sabi sa mga research, hindi naman daw harmful yung beads, but I’d rather use natural exfoliants pa rin. It’s back on my “good, but can do without if possible” list. Hehe. Ahh I can see why people would want to avoid shark liver *yikes* those poor sharks. I seriously need to lay my hands on some One Love! I think I might get along well with both the serum and the eye cream 🙂 Also, LUSH: that’s one of the reasons why I’m not big on the brand (another reason is all their products are SO heavily-scented)! I have the impression that they want to look all-natural and all-good, but it is not the case if you read through the ingredient lists. They’re amazing! 🙂 I’ve been sampling them and I really wish they were easier to obtain from Manila. AHHHH LUSH. Haha I get in such a rage when I remember. D: I love a lot of their scents, so I don’t really mind, but it’s so annoying how they’re posturing as a natural brand—no matter how many times they say that they never say they were natural, that’s how they are acting as a brand—with products that are full of chemicals. I have a lot of “dirty” products, but at least they are not trying to look all-natural. Hey Abigail, I bought mine from Eco Diva Beauty, which I think is based in North America. It’s $68. Are the Happy skin lippies really that good? I have been telling myself that they are just your average lip crayons, but I have onlu heard good reviews from beauty bloggers. Haha, awesome! Yeah, I have way too much eyeshadow, but there’s always something new you need to try, isn’t there? Good luck! Yes, I really love them. 🙂 They are very easy to wear and have a great color range. Thank ya! Omg, I have so much stuff to sell. Sayang talaga haha. Thank you, though! Which Shut Up and Kiss Me lippies did you buy? I sooo need to get my hands on some KW and Ilia!! Agree about the price of the Nars singles…it’s put me off for now. I have an addiction with the Happy Skin Shut Up and Kiss Me Moisturizing Lippies! I think they’re the best local makeup brand out there! Have you tried any of their new shades? Not yet, I stopped myself! Hehe. 🙂 I think they’re one of the best, too. 🙂 I think they really thought of their branding and identity and that makes me appreciate them as a brand even more. Where are you going this month!? ❤ I'm sure you will be able to visit them soon!